One Live Frog is Swallowed and Over With! I’m sending a great big “THANK YOU” and (((hugs)))) out to everyone who has prayed for me and encouraged me through the mastectomy on Tuesday. God took such wonderful care of me through it all and I had exceptionally excellent care by my breast surgeon, all the staff at FL Hospital Altamonte, as well as my family. I am relieved to have the surgery behind me and I am recovering well at home. Do you guys know about Mark Twain’s “Eat a live frog every morning” principle? http://www.fastcompany.com/1592454/work-smart-do-your-worst-task-first-or-eat-live-frog-every-morning I was really dreading that operation and it sure feels good to have that big ole’ toad swallowed and over with! The first step I needed to do in conquering this beast is done. The final pathology report should come through next week and then the following week we will discuss the best course of follow up treatment plan with my oncologist. God is holding me tenderly in the Palm of His Hand. We’ve received word that Paula finished surgery around 5:15 PM. Dr. Minton just came out and spoke with us. She shared that everything went well (thank the Lord!) and that the two sentinel nodes did not show any cancer, so she did not need to remove any further lymph nodes. This also means that Paula should not need any radiation this go around, just chemo; the recommended type and frequency of chemo will be determined by the oncologist, Dr. Molthrop, based on the size of the cancerous nodules. Thanks again for your prayers. I’m waiting now for them to come get me so that I can be with my precious Paulita! Greetings! We want to thank everyone, first of all, for your prayers and encouragement. We had a nice prayer time yesterday at NTM, and we know that many others have been and are continuing to pray for Paula and our family. I’ve been under the weather a bit the past couple days. I think I may have caught the flu or something (perhaps on one of my flights back from Tanzania) and unfortunately now Joy and Paula have perhaps caught it from me. Paula had a slight fever (99.3) this morning, but was feeling better than yesterday, so we touched base with her surgeon and the anesthesiologist, and they were good to continue with the surgery as scheduled. After checking in here at the hospital, they took Paula to the Nuclear Medicine area to do a sentinel lymph node mapping around her right breast. They injected a radioactive substance under the skin of her breast, waited a few minutes as it started to be channeled through her lymph ducts, then take some pictures (with Paula herself acting as the radioactive x-ray machine) which then show the primary (sentinel) lymph node(s) in that area. I believe the thought is that if her cancer had spread to any lymph nodes, it would tend to be channeled through the sentinel lymph node(s) first. If the sentinel nodes appears to have any cancerous cells, they will then likely remove additional lymph nodes. We met the anesthesiologist and his two assistants, as well as the surgical nurse who will be assisting the breast surgeon, Dr. Lisa Minton. Surgery started around 2:30 PM, so we are expecting it to finish any time now. The plan is to do a simple mastectomy of Paula’s right breast, implant an intravenous port in the left side of her chest (to be used to administer chemo in the months ahead), and to remove and evaluate the sentinel lymph node(s), and, only if needed, remove other possibly affected lymph nodes. We continue to pray for guidance for the doctor, God’s care for Paula, and that everything would be successful with no complications, no infections, etc. When the surgery is complete, I’m expecting Dr. Minton to come out and speak with me. It will probably be another hour or so after that before Paula is moved from the recovery room to a hospital room where I can then be with her again. Tomorrow (9/27) I put on my pink boxing gloves and am getting in the ring again to punch the lights outtta cancer before I follow up by blasting any remnants of this beast to smithereens with chemo! Although, honestly, I don’t know a thing about boxing, I’ve got God and my breast surgeon in the operating room with me so I’ve got a great team fighting for me as I sleep through this round, ha, ha. I want to say a great big “thank you” to you guys on the side lines cheering us on. Cancer is rough on the whole family. We so appreciate your encouragement and for keeping John, Nicholas, Joy, Hannah, and I in your prayers. 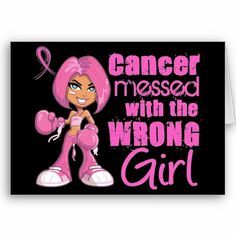 I’m gearing myself back up to get in my “Cancer Fightin’ Warrior Woman Mode” with my eye on the prize and I’m fighting to win. The surgery is at 1 PM EST with an injection in Nuclear Medicine at 11am for sentinel node mapping. My husband will pop a note here postop to let ya’all know I’m doing great. 🙂 I should be in the hospital over night then will continue my recovery at Home Sweet Home. The plans are for me to begin chemo in about a month. Next Tuesday, September 27th at 1 PM I am scheduled to have my right breast removed. It’s my second and final remaining breast to lose then I’ll be plum out of breasts for cancer to try and make a home in again. I sure do hate to see my last “Bosom Buddy” go though! My life is overflowing with gifts from God to be grateful for. Sometimes I forget to count and appreciate my blessings ’til I lose them or am about to lose them. In our culture breasts are a symbol of sexuality and femininity. I have never considered them as “disposable decorations” on my body but it is nearly time to part ways and I am taking time to grieve and ponder and give thanks for the gifts these have been to me as I release my ownership and the “right” and “privilege’ and “desire” to keep my breast intact and remaining on my body. Like the left one in 2011 that had to be removed, now the right one is diseased with the same type of aggressive cancer cells whose very nature is to metastasize to the brain, bones, lungs, and liver. I am so very thankful that there is absolutely no evidence that it has gone outside this breast. I will fight every way I can so those cancer cells are stopped in their tracks and eradicated. This unwelcome malignancy beast has returned and has been given its eviction notice and my surgeon, oncologist, and I are ready to kick cancer to the curb and render it homeless from my body, this time FOR GOOD. This second breast amputation is one of the drastic measures warranted and so I will do what I don’t want to and wish I didn’t have to do. It’s time to let go of my last breast next week so I can live healthier and longer. My goal is for the “Glad to be a Senior Citizen and living a full, happy life Plan” and that is my aim. I know that it is God who has wisely numbered each of our days. Thank You Heavenly Father for both breasts that You blessed me with for a time. Thank You that I am just as much a woman inside and out without these parts. Even though I know this is true, I am still struggling inside and wrestling with the awfulness of this great big cancer mess and the thought makes me cry. Please help me. Lord to see myself as You do and with Your perspective as I am stripped of my last remaining breast next week and as I think about getting chemo again. Thank You, God for the pleasure that you designed breasts to be between a husband and a wife and that there’s still the whole rest of my body, mind, spirit, and soul left for that beautiful blessing and gift. Thank You for my dear husband John who understands the meaning of true love and commitment that is not based on appearance or circumstances. How blessed I am that he cherishes, loves, and accepts me no matter what. Soon I will have chemo again which can make a person feel pretty gross in itself and then likely all my hair will fall out like last time. Being bald, sick, and breast-less seems like such an ugly thing. Father, these losses hurt. It was not an easy decision for me not to have fake breasts reconstructed but I think it’s the right decision for me at least for right now anyway. I might change my mind in the future, I dunno. Lord, please show me practical ways through all of this that can help me look and feel my best to be feminine and attractive. Most importantly, please make me beautiful on the inside where it counts the most. Thank You Lord for the uterus and ovaries that You gave me that will be surgically removed after I have healed up from chemo. Hormone blockers to help prevent the recurrence of cancer have caused my womb to grow polyps and dysfunctionally bleed. I am so thankful for my uterus that was once healthy and strong and, despite four miscarriages, allowed me the joy of conceiving and that it was a nurturing place to carry both my girls full term and then give birth to them. I loved being pregnant. I am also so very grateful for adoption that allowed our dear son Nicholas to join our family when he was almost three. I love him so much, just as if I had given birth to him as well. I love, love, love being Mom to my precious three children. It’s a wonderful gift to be a mother and I have been abundantly blessed beyond measure. My two healthy breasts allowed me to nurse my girls as babies. What a blessing that was to me and to them. What an awesome arrangement to be able to bond in such a special way while giving one’s baby optimal nourishment. I treasure the remembrance of my little sweethearts snuggled close, big blue, adoring eyes gazing with sheer bliss into mine as my abundant, overflowing supply of milk dripped down their sweet, round faces. Thank You Lord. Breastfeeding was a priceless gift for Joy, Hannah, and I that cancer can never take away from us. Thank You Lord for designing such a plan that binds together a mama’s heart and her babe, right from the start of life together. As I bid farewell to this last breast, I still have the memory of nursing my babies long ago to treasure in my heart. So many things in life boil down to choice. I choose thankfulness in the midst of grieving. I choose God’s peace which passes understanding. I choose joy and grace and hope. I can’t pretend that I don’t have a scaredy-cat heart because I do. I choose to give that trembling heart over to God and ask Him to help me to snuggle up in His love and rest and trust. Today is the day. I am a member of the surgical team who will take care of you — the team that will remove your breast to treat the cancer that has tried to make a home in your body. We all have our role today, and the world would see yours to be the “patient.” I see it as something more: a powerful gift to us. I wish there were a better way. Today we will ask you to take all your clothes off and put in their place a gown. Women before you have worn it. Women after you will wear it. Be sure to ask for warm blankets, because we always have plenty. We will ask of you your blood type, your medical history, your allergies. We will ask you to lie down in a bed that’s foreign to you. We will have to poke you so that we can start an IV. We will take you into the Operating Room — a room only few have seen. There will be bright lights, lots of metal, instruments that you’ve never seen, and we will be dressed in gowns, gloves, and masks. Over our masks, we hope you can see our eyes reassuring you as you go off to sleep. Your breast has felt the warmth of a lover’s caress, has fed your child with life-sustaining milk and connection. You have many memories stored in your breast, stories none of us today know about. Somehow I wish I knew them. My job is to help your surgeon take away the cancer. I get a bird’s eye view of the process. The surgery begins and I feel your warm skin through my gloves. I wonder what stories you already have and the ones that are yet to come. I look down and see your pectoralis major — the big muscle behind your breast. A source of strength. It is beautiful and shiny. Sometimes it contracts a little bit while we work. Sometimes the muscle is bright red and young. Sometimes the muscle is faded a little. But it is always strong. I like to gently touch it withmy fingers. Because I feel your strength there. Sewing your skin back together feels like I’m helping a little. But I know it’s actually all you doing the work. Even as you sleep, Dear One. I watch you as you wake up. And I want to make it all go away. I can’t. Today your body underwent a transformation. And today our team took care of your body. I hope we took care of your heart, too. “Chemo Brain” and aging can do that. 28. The satisfaction of planting two packages of string beans (one green, one yellow) in grow boxes, and six packages of a variety of flower seeds in pots and in the dirt next to the blackberry bushes. It’ll be fun to watch them grow. 32. I am very thankful for all the encouragement that I am blessed with by email, with Social Media, comments in the blog, on the phone, by snail mail, and in person. I am so thankful for all who are praying and cheering me onward and that I don’t have to face cancer alone. I am rich indeed in family and friends. At the conclusion of the message she shared the telegram with us, and she added: “I have never traveled alone, but, ‘For This I Have Jesus.’ I must take a midnight train, but, ‘For This I Have Jesus.’ I must cross the channel and make connections on the other side, but, ‘For This I Have Jesus.’ Then I take a long train trip to the south of England, but ‘For This’ and all the suspense along the way, ‘I Have Jesus’.” As she spoke these words, we saw the Light of Heaven upon her face. Yesterday in the early evening I got a call letting me know that my surgery date is set now. On Tuesday, September 27th I am scheduled for a sentinel node biopsy, a modified radical mastectomy of my right breast, and a port placement inserted under the skin of my then breast-less chest for administration of chemotherapy and a year of IV Herceptin. I’ve wrestled back and forth whether to do reconstruction at the same time and have decided to hold off for the time being. I can choose to do it on both sides at a later date if I desire. Maybe I will, maybe I won’t but for now that’s one less thing on my plate and I feel the most peace about this route. I’m glad that there is no “right or wrong” and that we, who face mastectomies, get to decide for ourselves if we will replace them with fake, reconstructed ones or not and the timing of all that. It’s a lot to wrap one’s mind around. I woke up crying in the middle of the night last night. I wish this big mess was just a bad dream but cancer is a wide-awake nightmare that is real. Honestly I hate cancer and the treatment of cancer. I wish I could eradicate this naturally by detoxing and building up my immune system . It’s contra-intuitive for me, a natural health minded person, to fight this with surgery then taking toxic drugs that kill both the good cells along with the bad. Last time I also had 30 rounds of radiation. I gave the natural approach all I had in 2011 and the cancer grew like wildfire before I went on to conventional cancer treatment . I’m glad that I did give the natural approach a try and don’t regret that, but alternative therapy did not work for me last time and it’s still not a viable option this time though I really, really, REALLY wish it was. I’m glad that I did not stay aboard a sinking ship but got off and went to Plan B even though it looked like a pirate ship was what was awaiting to rescue me when Plan A didn’t work. I gotta let that all go and even though I don’t like what I need to do AT ALL , I will move forward using weapons and tools that were very effective last time to fight this same beast who has returned. How I wish I could get to the cause of the cancer and pluck out that root so the cancer would be permanently gone and would not rear it’s ugly head again and would not be able to pop out somewhere else after we’ve chopped it out and poisoned it with chemo. I sure wish I could fix the underlying problem of whatever makes me an unwilling culture medium for cancer in the first place. I feel sad inside. I’ve been grieving over the impending loss of my second breast, emotionally preparing myself to be a bilateral breast amputee. What an awful way to put it, huh? That’s what it feels like to me but I can part with my breasts because it is necessary and warranted and I figure I am trading my breasts for a longer, heallthier life which makes it totally worth it to me. It still hurts though. I am also trying to get my mind in a good place and able to view chemo, not as the toxic poison directly injected into my bloodstream , capable of causing other kinds of cancer and a myriad of other horrible, bad things, (which is true but I don’t need to dwell on that part) but instead, as a way to eradicate these malignant cells that are multiplying so that I can heal and get well again,.I am asking God to change my perspective and to help me view all this with courage and in His strength and grace. In with contentment, even in this. “At all times, in all circumstances, Christ is able and willing to provide the strength we need to be content. Contentment occurs when Christ’s strength is infused into my weak body, soul, and spirit. To infuse means to pour, fill, soak, or extract. Every morning when I dip my herbal tea bag into boiling water, I witness infusion. I am going to think about this analogy of herb tea as I drink it. I am blessed with an infusion of God’s Word, steeping into my mind and transforming it as I read it, memorize it, meditate on it, and apply it. That’s what I need and want: for God to transform my mind through Scripture and give me His perspective in living the rest of my life the way He wants me to. I’m glad God understands when we are sad and grieving over losses or worried about scary things. He is taking me in His Arms and letting me cry, then wiping away my tears as He draws me in closer to His wonderful Self. He is teaching me to snuggle up in His love and rest and trust. I have so many things to be grateful for. My cup overflows with His blessings. Thank you for praying for me and my precious family. We really need it and appreciate it. That’s #13 on my gratefulness list today. I am so relieved. “It has been well said that a man never sank under the burdens of today. That the weight becomes more than he can bear. It is your own doing, and not God’s. He bids you to mind the present and leave the future to Him.